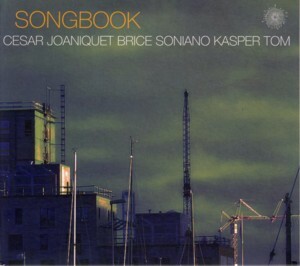 This is the debut album by the international trio comprising of Spanish saxophonist Cesar JoaniquetFind albums by this artist, French bassist Brice SonianoFind albums by this artist and Danish drummer Kasper Tom ChristiansenFind albums by this artist. The album presents nine compositions, six of which are standards and three are originals co-composed by the trio members. The music is a subtle tribute to Billie HolidayFind albums by this artist, as the six standards are associated with her heartbreaking performances of these tunes. Of course the trio treats the standards only as a very loosely melodic / harmonic structure, while they improvise extensively and intensely. These three young players have all already established quite a record in the last few years, which puts them in the top echelons of the European Jazz scene in spite of their age. Anybody listening to this album should immediately understand why, as their performances are simply stellar. Joaniquet, when playing the melody lines, sounds remarkably close to Stan GetzFind albums by this artist, which is probably the highest compliment I personally could give any saxophone player, as I was sure until now that nobody will ever come close to Stan´s phrasing and sensitivity. Well, I have been proven wrong. When he improvises freely, he is of course in a different musical universe, so the similarity to Getz does not apply, but he still is a brilliant player. Soniano is one of the most imaginative and expressive bassist I happened to came across lately and his work on this album is a superb example of the role of the bass in contemporary music; no longer a background support but a soloist of equal standing and importance to the other band members. His tone, technique and ability to converse with his cohorts is nothing short of miraculous. Kasper Tom, an old acquaintance, has already captured my attention many times before and his highly unique approach to drumming, or rather playing the drums, has been a pleasure to follow through his diverse and always courageous and groundbreaking recordings. This album is an instant classic, a case study of the "Art of the Trio" variety in the Jazz idiom; in which telepathic group improvisation and lofty inspiration take the music straight to the top of human gratification hubs. This is definitely some of the finest music that landed on my player this year, full of immense aesthetic pleasure as well as intellectual contentment. Way to go!